For your next party, why not set up a baked potato bar!!! Baked Potato Bar is Party Perfect. Simply pierce your extra large, scrubbed russet potatoes, wrap them in foil and bake. After an hour or so, when the potatoes have finished baking, remove them from the oven, carefully remove the foil, place them in a slow cooker, set it to warm and cover. Place your baked potato filled slow cooker on your buffet table, surrounded by baked potato ‘style’ ingredients. 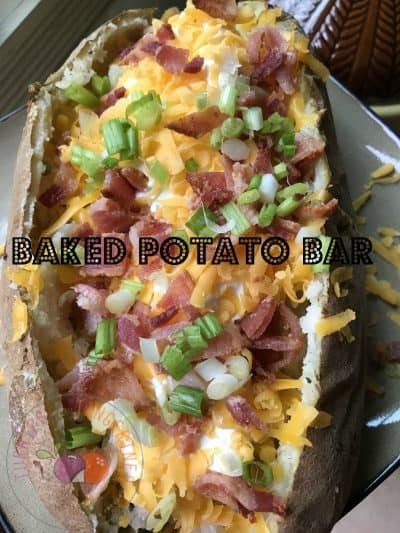 Loaded Baked Potatoes with cheddar cheese and crispy bacon are perfect to serve before, during or after Sunday’s football game or if your like me and a baseball nut, you’ll serve loaded baked potatoes while cheering on the Milwaukee Brewers!! 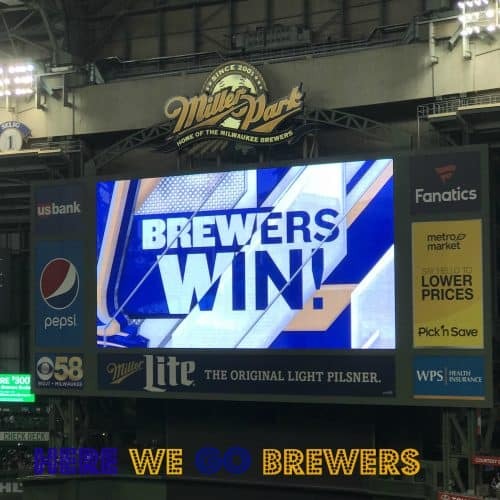 This week we are rooting for our Milwaukee Brewers and we have our fingers crossed that they will make it to the World Series. Friday I had the misfortune of spending some time at the oral surgeons office, which is another reason for this recipe. The Dentist gave me specific instructions to eat ‘soft’ food and baked potatoes seemed to fall into that category. Loaded baked potatoes can be topped with any ingredient you can possibly think of really. 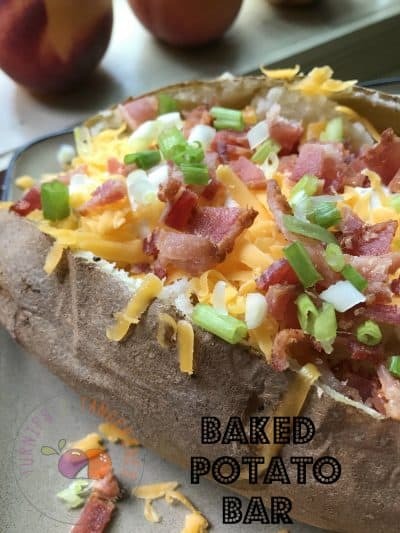 For this recipe we topped our potatoes with the usual baked potato toppers; butter, sour cream, cheddar cheese, bacon and green onions but another favorite of ours are Taco Topped Baked Potatoes. Taco topped baked potatoes are exactly what the name implies, baked russet potatoes topped with your favorite taco toppers. Ground beef browned with an envelope of taco seasoning, sour cream, shredded cheddar cheese, chopped onions, tomatoes and avocados, sliced black olives and drizzled with taco sauce. Basically anything you like on your taco, you can also top your baked potato with. How great is that! Setting up a Baked Potato Bar is the perfect solution to any party. Whether your having a baseball or football party, hosting a baby or bridal shower, a baked potato bar can be the answer your looking for. 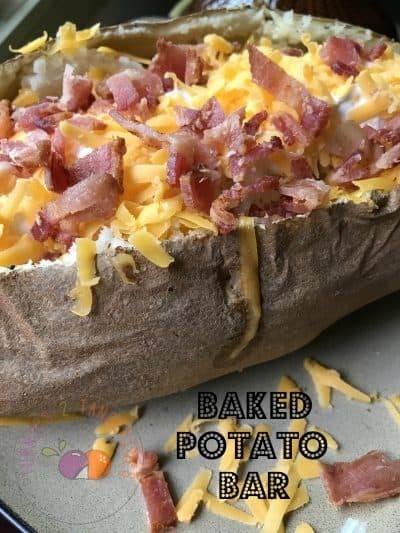 After all, who doesn’t like a baked potato! Set up a baked potato bar at your next party! Preheat oven to 400°. Prick potatoes all over with a fork or sharp knife and wrap tightly in foil. Bake until soft, about 1 hour. Unwrap potatoes and cut lengthwise slits in the top of each. Carefully scoop out flesh from center of each potato into a medium bowl, then add butter, sour cream, chives, green onion, half the cheddar, and half the bacon. Season with salt and pepper. Spoon filling back into each potato, mounding it on top. Sprinkle with remaining cheese and return to oven until melted, about 5 minutes. Top with greens onions and remaining bacon. Alternative directions: Preheat oven to 400. Prick potatoes all over with a fork or sharp knife and wrap tightly in foil. Bake until soft, about 1 hour. Unwrap potatoes and cut lengthwise slits in the top of each. Using a fork, 'fluff up' the insides of the potatoes. Serve the potatoes with ingredients as for 'self serve' potato bar. *Potato Bar Instructions: After potatoes have been baked in the oven, keep them warm by placing them in a slow cooker. Remove baked potatoes from oven, carefully remove foil, and place potatoes in the slow cooker. 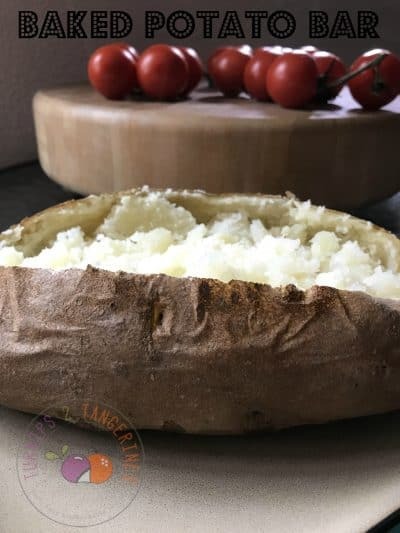 Turn slow cooker on warm setting and place on buffet table with remaining baked potato ingredients set out in covered bowls. *This recipe makes 4 baked potatoes. This recipe can be changed to accommodate any number of servings. Double or triple the ingredients per servings needed. Set up a baked potato bar with all of your favorite taco inspired ingredients. Meanwhile, brown ground beef in a medium skillet. Drain off fat. Sprinkle envelope of taco seasoning over beef, add water. Bring mixture to a boil, reduce heat and simmer 10 minutes. Unwrap potatoes and cut lengthwise slits in the top of each. Using a fork, 'fluff' up the inside of the potatoes. Serve baked potatoes with taco meat, sour cream, green onions, shredded cheese, tomatoes, black olives, avocados and taco sauce. Alternate Potato Bar Instructions: Preheat oven to 400. Prick potatoes all over with a fork or sharp knife and wrap tightly in foil. Bake until soft, about 1 hour. Meanwhile, brown ground beef in a medium skillet. Drain off fat. Sprinkle envelope of taco seasoning over beef, add water. Bring mixture to a boil, reduce heat and simmer 10 minutes. Transfer beef mixture to a small slow cooker. Set to warm. Remove baked potatoes from oven. Carefully remove foil and place potatoes in a slow cooker. Set slow cooker to warm. Place slow cooker filled baked potatoes, slow cooker with taco meat and all remaining taco toppings on buffet table for 'self serve' style potato bar. Slow Cooker Easy French Dip Sandwiches would be great served on your Baked Potato Bar, for those with a heartier appetite. Wow! This is really a party perfect recipe. Been searching for new recipes for my son’s birthday party next week and can’t wait to bake this one.